With the exception of July 4th weekend, the upcoming Labor Day holiday is usually the most profitable week of the year for a wide range of small businesses. For countless amusement parks, boardwalk arcades and seaside vendors, the week leading into Labor Day represents one last hurrah for the season. After all, who is going to play ski ball or purchase a hermit crab cage once school begins? Businesses catering to higher-end clientele, such as restaurants and nightclubs in places like the Hamptons, for instance, rely on the last week of summer for one last big infusion of cash. If trains and highways are not back in working order quickly, people may opt to remain in New York City or look for another destination to play during the long holiday weekend. Hurricane Irene’s destructive path along the eastern seaboard of the United States has also changed the fortunes of many small business owners who are not in seasonal industries. Some, such as Kilkenny House, an Irish pub in Cranford, New Jersey, have suffered major damage. In the aftermath of the storm, waters filled the entire basement of the pub and covered more than a foot of the restaurant’s dining room. Owner Barry O’Donovan hesitates to predict when he will reopen, but he will likely not be up and running before his annual “Half-way to St. Patrick’s Day Party” (September 17th), one of the biggest days on the calendar. Anyone who still does not have electricity or a makeshift power source is losing revenue as each hour passes. Coffee shops, newsstands and other businesses that rely on commuters for their revenues will see their revenues drop until transportation is back on a regular schedule. Much of the country has endured severe weather this year. States in the southeast have experienced drought conditions for months, Dallas has had more than 50 days of 100-degree-plus temperatures, and during the winter of 2010-11, the northeast faced record snowfalls. While hurricanes, earthquakes and other acts of nature are uncontrollable, small businesses have to be prepared both physically and monetarily. Business owners in seasonal occupations — such as landscapers, construction workers and summer tourist industries — have always had to manage their cash flow during the boom times to survive during the lean periods. Disaster occurs when unforeseen circumstances, such as the walloping delivered by Hurricane Irene, hurt firms during what should be a profitable period of time. Businesses that must recover from storm damage must have repairs made immediately, incur the deductible amounts of their insurance policies, and wait weeks or sometimes months for their claims to be processed. Being short on cash could put some of them in serious danger. 1. Have a line of credit available. A business line of credit is designed to get a company through times of disaster and other lean periods. Additionally, using a line of credit and quickly paying it off can help build one’s credit rating, which is important if a larger infusion of capital, such as an equipment or expansion loan, is required at a later date. Many banks offer lines of credit at reasonable costs. A credit line can be a lifeline for a small business owner in times of trouble. 2. Manage your cash flow well. Managing cash flow is challenging, but it is one of the most important things a business owner can do. A well-managed company can endure times of distress or seasonal lulls if the owner keeps a close eye on marginal cost structure. Schedule only the amount of staffing you need to run efficiently. Furthermore, fixed costs can be negotiated — especially in a down economy. For instance, if property values are declining or if shops are becoming vacant in your area, lobby your landlord for a rent reduction. Keep a balance between accounts payable and accounts receivable. This is a simple but overlooked practice that business owners should employ. Additionally, be sure to submit your invoices on time to maximize cash flow. If you are in a cyclical or seasonal business, squirrel away enough money during the good times to get your business through the lean periods. 3. Don’t put all your eggs in the insurance basket. Insurance policies exist as a safety measure for small business owners in times of trouble. They also exist so that insurance companies make money. Even with the best reporting and documentation, it takes time for insurance companies to pay claims. 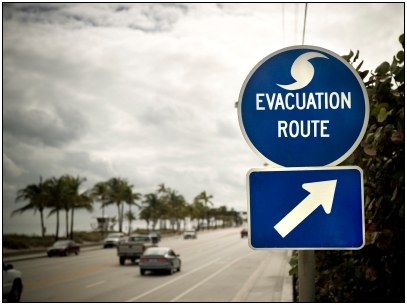 Paradoxically, it is in times of disaster that small business owners need money most quickly. It may be a challenge, but owners of small firms must try to put away as many reserves as possible just in case disaster strikes. If you find yourself in a position of needing a loan to get through a rough period, leverage technology to make the process easier and save them time. Companies such as Biz2Credit streamline the business loan application process by standardizing procedures and automatically connecting entrepreneurs only with lenders whose criteria they meet. Inevitably, there may be some small businesses that will not be able to survive Hurricane Irene or a similar disaster. How entrepreneurs react now and prepare for the future will have a large bearing on their long-term viability. This is especially important in an economy in which small businesses are responsible for up to two-thirds of all the new jobs created. You are currently browsing the Business, finances, forex blog archives for August, 2011.